Scotland, to Ireland, and Global. A. We are tracing two diasporas - of an comparatively uncommon surname, McConaghy, in Ireland and Scotland. Variations: McConaghy, MacConaghy, McConnaghy, Maconochie, McConaghey, and on withspread as spellings changed. Find e's added and subtracted, c's for g's, e's for y's. The name now is not only in the British Isles, but in Australia, South Africa, Egypt, the US, and with military in two World Wars and other wars. Matthew McConaghy b.1780; Grandsons James Foster McConaghy and Robert McClure McConaghy (sons of Joseph - 6); Robert McClure McConaghy had six children, including Robert McClure McConaghy (Jr? II?) b.1877 who married Louise Lucinda Brien (Hilliard b.1877); they had five surviving children, including my mother, Marjorie McConaghy. And pages more. Researching: It takes a family starter. Our McConaghy records and research is from a family archivist, Violet, a splendid human being, now up in years. We have a number of her letters, logs, research papers; and visited St. Johnston and other family locales. Another cousin has written a narrative with sources. Our correspondence with Violet began in the 1970's; the recent cousin's work is still in progress. Anything we found from the internet is labeled. We chose one, Maurice, who was born to a military-medical family in Her Majesty's Service in India, went to Sandhurst, received his officer's commission and served in the Boer Wars; then in WWI where he was killed at Arras, France. We visited his grave there, and also there began our keen interest in his life experiences. Details of the family tree follow, since 1785 or so in Donegal starting; but that is of interest only to us. For anyone else, meet Maurice. "Scotties" from Ireland to Scotland, Scotland back to Ireland. See the Scots side, Edinburgh and Argyll, at Scotland Road Ways, Surname Roots, Exodus, Campbell, McConaghy. Then find Scots (and English) who were recruited by the British Crown, the landed and landless, to settle Ulster in Ireland, pushing out whoever was there, beginning in the early 1600's. This became known as the Plantation. We need to root through Pynnar's Survey more on this, for names: see http://books.google.com/books?id=tW6edf-80pIC&dq=Pynnars+Survey&printsec=frontcover&source=bl&ots=zwTaj72Wdw&sig=KTwc45K2p_OVCAwreK4avdpxfsg&hl=en&ei=rHLnSpOwFJTFlAfEkfCLCA&sa=X&oi=book_result&ct=result&resnum=8&ved=0CBwQ6AEwBw#v=onepage&q=&f=false/. The Plantation was the Ulster Plantation, of James I, and it holds roots of current conflicts with "Northern Ireland" and the Republic. We find family on many sides: Anglo-Norman, Plantation Protestant, indigenous Irish Protestant. 1. 1785 est, Matthew McConaghy was born in Greenhills, Convoy / Raphoe, County Donegal. Farmer. 1.3 Robert McConnaghy. Robert married Margaret Allen, who was born in Greenhills, Convoy / Raphoe, and died in 1857. Robert was from - born in? - moved to Carrickbrack, County Donegal, and died in 1857. He was a farmer. He owned 13 acres in Raphoe. 1.4 Rev. Joseph McConnaghy born 1811, died 12/31/1875 , St. Johnston, County Donegal, Ireland. He married Mary McClure, St. Johnston. St. Johnston - St. Johnstown, Taughboyne, Co. Donegal, see http://freepages.genealogy.rootsweb.ancestry.com/~donegal/taughboyneproj.htm/. e. the fifth son, Rev. John McConaghy, b. 1812, scholar, Glasgow Univ. 1832, ordained in 1837, Urney, lived in Sion Mills before moving to "Larkfield" Urney, County Tyrone. Married Elizabeth Cunningham b.1813, in 1841. They had seven children, and descendants include William and his cousin Maurice, both killed in WWI. There is another Matthew McConaghy, of Antrim, born 1842, who may be the son of our Matthew, but who knows. This is fun, not obsessive despite the long entries here. The joy of the chase. Put enough stuff down and see what connects. Non-Maconochies, use these sites to look up your own ghosts. Family issues repeated in the generations, noone resolves, are you in the snare? 3. The main inheritance surname, Maconochie, McConaghy, McConaghey, etc. Cunningham. Elizabeth Cunningham was the daughter of Robert Torrens of Ballyfatton Cottage, Strabane. but Violet's brother, Charles, has a family painting of an elderly woman named Cunningham, and that name appears on the gravestone of the wife of the Reverend John McConaghy at St. Johnstone; and on the stones of several descendants. She died in 1898. "Larkfield" Urney, County Tyrone. There are apparently records dated Dec. 11, 1881 and 1882, a stone. Who was it who was age 70 then? Sion Mills - more connected to Rev. John before he moved to Larkfield? Have to repeat some here. Robert McClure McConaghy married Sidney Torrens b.1850, on June 6, 1870. Sidney is daughter of James Torrens. Sidney and Robert married at Sion Mills, County Tyrone. Pynnars Survey of Land Holders - this gives us the real names of landholders, and the location/ condition of their property in Ireland. This includes Counties Armagh, Tyrone, Donegal, Cavan, and Fermanagh with notes on Londonderry. It was originally compiled as a result of the 17th century plantation of Ireland (1609+). A landholders census record, it set about to give us the results of the 'planting' of families from outside Ireland onto Irish lands. Here, Pynnar gives us the name and condition of Undertakers, servitors, and principal natives on these Ulster lands. That from http://www.irishroots.com/id4055.htm/ Who can go through Pynnars? It is really big. This other site says Matthew #1 had 5 sons, not 4. See old census by Rev. John Wray in 1822, a friend and fellow clergy to Joseph McConaghy, as to his flock in Convoy, Raphoe Valley, County Donegal. Is this census the same as a book apparently written, called "Convoy", with access to records now lost. Go to this Convoy-search result site, http://freepages.genealogy.rootsweb.ancestry.com/~donegal/convoybmdnotices.htm/ and find several McConaghy's and McClures and related spellings, births, marriages deaths. This is not my field, I am just passing connections on. Archivist, VP, is elderly. Ordained 1834, Irish Presbyterian Church. His church was at Dundee, St. Johnston, near Strabane. Joseph and Mary are buried there. Matilda Ellen McConaghy also buried there. 1843-1863. Is this a daughter? See the later Matilda, below. Both John Wray and Joseph McConaghy had "a wonderful knowledge of most diseases to which the human frame is subject and turning this knowledge to account he was enabled to alleviate mch pain and suffering throughout the entire neighborhood." See Death of the Rev. Joseph McConaghy, copied byVP "from a newspaper cutting pasted into a session book of Saint Johnston Presbyterian Church." We have a copy of the typed copy. What is this custom? After praising his life, the article continues: "Nor is it by any means wonderful when as in his case the golden bowl broke, and the silver cord snapped, many, very many, real mourners were going about the streets." Is that part of lowering the coffin? No idea. Now: Joseph McConaghy and Mary McClure apparently had a number of sons, including a James. We find a James McConaghy who married Margretta Elizabeth Hamilton, born 1848, and a saga unfolds at the Hamilton site, by Robert Wilson Hamilton, at http://www.stjohnstonandcarrigans.com/rwhamilton.html/. This Dr. James McConaghy (a medical doctor) is affirmed there as the son of the old minister at St. Johnston, Joseph McConaghy/ James practised in the Orkneys, and lived in Sanday. See Orkney Road Ways, Sanday. He and Margretta had five children, and they moved to London for the sake of the children's educations, but only stayed a few years. James went after his mother-in-law, Jane Hamilton, by writ in Dublin in 1886 for some 250 pounds plus interest. ''*** My wifes family have a commemorative 14.5" solid silver plate presented to Dr James Foster McConaghey on January 15 1884 by the people of Sanday for his good works and kindness to the poor. Should you be interested to see pictures of this plate please email....***"
So we did, and here is one of the photos. The 1851 census apparently was lost in Ireland, so there are many gaps. We have a large family tree done by Violet, however, and will do our best with it - pending. She also did a piece on ancient history, where Celts and others went, Pytheas of Massilia (who?) great fun. No direct line of course, but interesting. What to do with her essays, accounts of her research? For fun, here is Louise Lucinda Brien (Hilliard) who married Robert McClure McConaghy in New York. She was my maternal grandmother. Louise Lucinda is the daughter of Margaret Hilliard, who was age 13-14 and working at the great Glengeen Lodge in Trillick, where the local nobleman, William Brien - then age 39 - had his enjoyment; and Louise Lucinda resulted. Was Margaret only 13 when the encounter took place? A cousin has researched that story. Louise Hilliard, the mother of Louise Lucinda. My grandmother grew up in Trillick, County Tyrone, and migrated here - proud of her second class ticket with her mother - in about 1889. Born 1872. Robert McClure McConaghy married Louise Lucinda (Brien) Hilliard, here with the father, known to us only by stories, and some letters, as Mr. Brien. If Louise came here at age 18 or so, and married at age 26 to Robert then age 28, when did they meet, where, what was she doing, was she working, was Mr. Brien supporting "Maggie" and Louise, as we know he later did; until the stock fell in 1929 and there were no more dividends. All gone. One story says he had his wealth not only from inheritance but also the laying of the AT&T cable on the Atlantic floor. Tales, tales. MAURICE MCCONAGHEY (brother of William, but he added the the "e") - died 1917, age 39 - Maurice Edwin McConaghey, Lt. Col., WWI, buried near Arras, France. See Belgium Road Ways, Battle of Ypres (Ieper), Maurice McConaghey. Royal Scots Fusiliers, buried at a pocket cemetery called "London Cemetery" at Neuville-Vitasse, France, near Arras. III C 13. 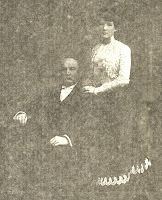 Old Matilda McConaghy and her son James McConaghy. Poor farmers in Convoy, County Donegal, visited by Violet in 1973. But there is another Matilda born 1871 of another line, in Antrim, from Hugh McConaghy born 1776, See http://braddonsmith.tripod.com/id6.html/ Which is this? We are looking for the parents of our Matthew McConaghy born 1785. Any connection? Ronald McConaghy, retired army major, lived in Yorkshire, England, with wife. No children. 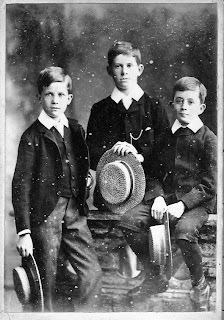 Christopher McConaghy and his two sons, live in South Africa. Charles McConaghy, brother of archivist VP, living in Bobcaygeon, Ontario, north of Toronto. What is an identity, its role in shaping a life. Is slavery identity theft, with ongoing repercussions. A family history is a privilege,a source of rootedness, a starting point for learning history, as well as a recreation. Should reparations for slavery be based on identity theft? Michelle Obama, I have a privilege that you do not, since records of your ancestors only go a limited way: see http://www.chicagotribune.com/news/local/chi-obama-slavery-01-dec01,0,485324.story/. Compare that to many of us of European descent, where the records of one of our many names go back hundreds and hundreds of years and even produce some laughs or aghasts (who was paid on a note, who was executed). Maurice Edwin up there. Buried at Arras, France, WWI. Find him there. Find old photos. Who married a good-looking, or prosperous person. Who did not. Worth the hunt. Posts are in process of arrangement by counties, with history iinterspersed.